St Finbarr's Pilgrim Path, Cork. St Finbarr’s Pilgrim Walk from the Top of the Rock, Drimoleague to Gougane Barra. 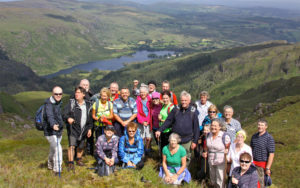 In West Cork and South Kerry the practice of walking pilgrim paths to St Finbarr’s hermitage in Gougane Barra has been in place for many centuries. One such path leads from Drimoleague, where – local tradition has it – St Finbarr arrived at the Top of the Rock in the sixth century and admonished the people to return to Christ, before making his way to Gougane Barra. In 2008, the practice of walking this ancient route was revived and, today, groups as large as fifty and as small as three or four are regularly found walking the 22 mile (35km) path. The route itself has been opened up to the public with the goodwill of local landowners, who maintain the walks under the Walks Scheme. Leaving aside the spiritual benefit this walk isalso a truly magnificent journey which goes “up and over” three mountain systems and four valleys, namely the Ilen, Mealagh, Ouvane and Lee valley basins. There are spectacular views over Bantry Bay and stretches of the West Cork coastline. A rich archaeological landscape is combined with interesting folklore. The characters one might meet along the way help to make this a memorable and powerful experience. But it is the spiritual aspect that attracts many people; the questions raised as you walk: “What motivated Finbarr to bring the good news of Christ to these places? What message did he bring that eclipsed the prevailing darkness which he challenged? And why is there an unusual sense of peace and restfulness in the beautiful island where he held retreat?” The contemplation, the seeking and the finding, the camaraderie of other “pilgrims” and the pains and aches at day’s end… All these make St Finbarr’s Pilgrim Way a special experience to be anticipated and experienced to the full. For further information on St. Finbarr’s Pilgrim Path visit the website at www.topoftherock.ie.